Pretty Magical, once you actually do it! I read The Magic Mala a year ago, started using the Mala beads but didn’t stay with it. One year later, I decided to try again, and wanted to share my experience so far. I had been extremely depressed, seriously so, and I had no energy. Every morning I’d wake up feeling a sense of doom and could barely get up. After a full night’s sleep! Everything seemed to be going wrong as a result. I was at a loss. I’ve been using the Mala for about a month now. My mantra includes affirmations of being energetic, fearless, healthy, abundant, and so on. https://bobolson.com/wp-content/uploads/2017/03/Bob-Olson_logo-1-300x110.png 0 0 Story Submit https://bobolson.com/wp-content/uploads/2017/03/Bob-Olson_logo-1-300x110.png Story Submit2018-11-13 11:20:082018-11-13 11:20:08Pretty Magical, once you actually do it! I was having trouble getting a job when I learned of Bob Olson’s book, The Magic Mala. I had applied for a dozen jobs but had not heard back for over a month. The story captivated me because I felt like the Robby character was so much like me. I loved the book and didn’t want it to end. After I finished it, I was inspired to do what Robby did, but I used a rosary that I already owned instead of mala beads. The results were amazing. Without applying for any more jobs, and after getting no response for what was now five weeks, I suddenly began getting calls to come in for interviews (3 total). I continued my mala practice through the interview process and by the end of the month I had my new job. It’s a better job than I’ve ever had and I love the people I work with. That’s my Magic Mala Moment. Thank you Bob Olson for writing this amazing and miraculous book! My father, though never the most footloose and fancy-free of souls, was always relatively healthy. As is with most families, my brothers and I placed silent odds among ourselves over which parent would leave this world first. That’s why, when the cancer diagnosis came in, it surprised everyone- especially him. Up to his diagnosis, I’d been using my mala as a means of gathering wealth. I focused on my business and growing my clientele. My mantra, “I am tapped into an infinite supply of abundance,” was exactly that: a mantra to attract as much money to me and my wife as possible. However, once the news from the doctors came in, my mind rightly couldn’t stop thinking about my father and his situation far, far away in another state. And then one morning while doing my routine it came into my mind: he’s going to pass away soon. Very soon. Meanwhile, back in Kentucky where they lived, miles away from my new home in Texas, Doctors and clinicians assured my mother and father that there were options and tests to be run and interpreted. People were hopeful. Yet every morning and night I meditated on my mala mantra, the notion that his time was limited solidified more and more into an assurance. I had to get home. Now. Fast forward one week later and I’m on a plane racing back home. He’d unexpectedly slipped into a coma hours after I instinctively bought a plane ticket home. His tests came back while I switched planes in Atlanta- inoperable. By the time I arrived home and pulled up to the hospital, it was time to give my father last rites. As we stood around him in the hospital room, each whispering our goodbyes, I held his hand. Moments later I just knew; he was gone. I’d been in the hospital room only twenty minutes and he waited until I arrived before letting go and passing on. We were so blessed to be able to all be there for it, together. Over the next week, one question that kept coming up was: how did you know? I didn’t know how to answer that at first until one morning while saying my intentions, it hit me: I didn’t. I just listened to whatever did. 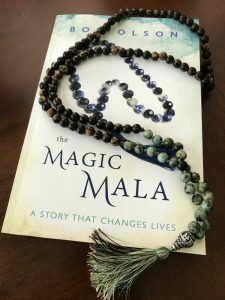 Having read “The Magic Mala”, I was excited by the prospect that I had the power to manifest those things in my life I wanted. Shortly after reading the book, I had gone shopping with my wife and started experiencing the symptoms of kidney stones, which I have had three times already: the need to constantly urinate, pain in my kidneys, wanting to vomit. And it is excruciatingly painful. I had spent days in the hospital, undergoing laser treatments to break up the stones, and discomfort throughout my body. I rushed home and went directly to the bathroom, and tried to urinate but no urine just the sensation, tried to vomit, but just saliva came out but the contractions in my body remained trying to expel something in my body. For the next three hours, I made numerous trips to the bathroom and nothing happened to rid my body of the pain. And the thought of the pain I was going to have to endure, and the trips to the doctors, and possibly hospital stays, all these things were uppermost in my mind. The fear was overwhelming. Finally, I had the revelation that I could manifest anything that I wanted if I just focused intently and with the attention needed for “it” to manifest. I had everything to gain and all the faith to make it happen. So sitting on the toilet seat, I closed my eyes, relaxed my mind and my body, and started envisioning the stone traveling out of my Kidney through the intestines and out to my urethra. I held this vision throughout the next half hour. And I knew that I could do it: rid my body of pain. I just knew! Then I “felt” the small stone drop into the water and the ability to urinate, and pain gone from my Kidney. I was overwhelmed with emotions that I had avoided severe pain and the profound knowledge that I had the power to make this happen. My Magic Mala Moment went like this: I was at a local, collegiate baseball game with my nephews this summer. We like to attend at least a few times each summer. This particular night I purchased raffle tickets for the 50-50 raffle. This is a raffle where they sell those blue paper tickets that are about a half-inch wide and an inch long. Half the money goes to the winner and the other half goes to the organization (hence the name, 50-50). Normally it costs five bucks and they give you 20 tickets. This night, because it was threatening rain and less people had attended, they were giving out 40 tickets for five bucks…a big long string of 40 blue tickets. Well it’s probably no surprise to you that I won. I won $134.50. Oddly, I kind of knew I was going to win. It was just a feeling that overcame my body. And of course my nephews were astonished. The 11-year-old ran up to collect the winnings with me. He was jumping out of his skin in excitement. Then, before we had any time to really celebrate, the rain came pouring down and everyone in the stadium went running for their cars. I didn’t get a chance to buy everyone hot dogs and pizza, but it sure made an impression on the power of setting an intention and repeating a mantra. I received for mother’s day a beautiful 108 mala beads from my daughters. The next day I started practicing following instructions from The Magic Mala book. Right away I felt lighter, happier like I was floating on clouds. I have been sad since the passing of my husband in 2013, now for the first time I felt hapiness again, alive. I set my intentions and sure enough things were coming my way, little miracles and big miracles. Two days into practicing, I went to get 3 vaccinations ordered by my doctor and she warned me that my insurance did not cover these vaccinations and they were going to cost around 500 plus. I was not surprised my friend have to pay for hers. To my surprise, the pharmacist told me they were free. You guest it, my first thought was “The magic Mala” is working. Now, I was going for the big miracle and I chose the Sunday Bob was having his live interview. I wanted the pain in my lower back, an injury from work back in 2010, and a pain in my right wrist that I had for 2 years to disappear. I woke up that morning with positive thoughts and said, today is the day I will be healed. I started my day with a little meditation followed by my mala beads practice, same mantra from the book but with a special intention. After the interview, I had so much energy, I decided to do some cleaning. I was tidying a book shelf, reaching high and moving heavy books around and all of a sudden, I noticed something odd, I did not believe it at first, I let out a scream, I just realized the pain in my lower back and wrist was gone. I am still pain free! The Magic Mala is now my good luck book, I carry it with me everywhere I go, even if I am not reading it. I cannot thank you enough Bob for writing this magical book, you really wanted the book to help the readers and I will always be grateful to you for giving us hope! You are an angel! I have experienced many Magic Mala Moments in the last five months, since reading the book and putting the lessons into practice. One of my favourites happened a week ago today. I was gifted “You Can Trust Your Life” with Cheryl Richardson and Louise Hay by a friend, who was having it shipped from HayHouse in California to me, in Halifax, Nova Scotia, Canada. On August 22nd I received an e-mail from HayHouse letting me know that the DVD had been shipped, along with the USPS tracking number. Out of curiosity, and not knowing how long it would take an item to travel that distance, I would check the website daily to see where the package was. On Wednesday, August 30th, the package was listed as being in Montreal, Quebec with the expected delivery date on Canada Post’s website for Friday, September 1st. Shortly after learning about Louise’s passing, I was shocked to receive an e-mail from USPS advising me that the package was fully delivered. Surely, it couldn’t be so! I was shocked when I arrived home and opened my mailbox. Sure enough, “You Can Trust Your Life” was delivered on August 30th, the same day that Louise passed away. Only Divine Energy could have orchestrated something so serendipitous and miraculous. I will be forever grateful for and amazed by this very magical moment.